You can enable network traffic encryption for data going between the source side and target side. Network traffic encryption helps you raise the security level for your data. If encrypted data is intercepted in the middle of data transfer, the eavesdropper will not be able to decrypt it and get access to it. Veeam Backup & Replication encrypts the network traffic according to the 256-bit Advanced Encryption Standard (AES). Data transferred between public networks is encrypted by default. If you want to enable network data encryption within the same network, you must create a network traffic rule for this network and enable the data encryption option for this rule. From the main menu, select Network Traffic. 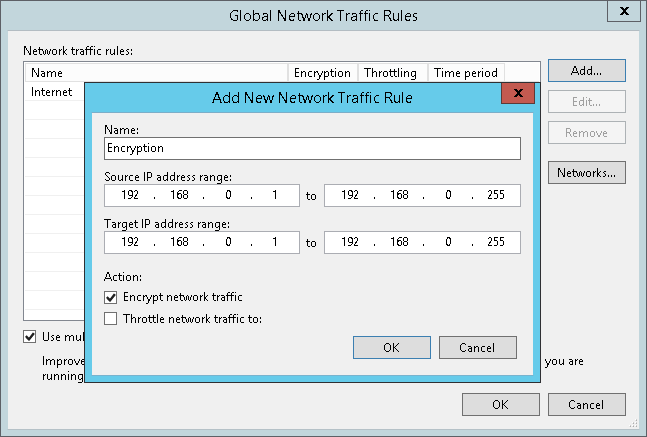 In the Global Network Traffic Rules window, click Add. In the Source IP address range section, specify a source range of IP addresses in the network for which you want to enable data encryption. In the Target IP address range section, specify a target range of IP addresses in the same network. Select the Encrypt network traffic check box. As a result, data traffic going between backup infrastructure components whose IP addresses fall into the source and target IP address ranges will be encrypted.